At this time of year many of us resolve to learn something new. Perhaps you’re planning to master a musical instrument, study a craft, or kickstart an exercise regime. Even if you don’t have a concrete objective in mind, there is something pleasantly self-indulgent and empowering about learning just for the sake of it. In this article I’ll be looking at some opportunities to pick up new skills and knowledge right here in Clarendon Park. And because learning shouldn’t be boring or hard work, every single one of these suggestions has an element of fun to it. Logistical particulars will inevitably change. For this reason I’ve provided hyperlinks within each listing so you can click through to the appropriate webpage to find up-to-date information about dates, times, prices and contact details. Ever fancied learning how to create your own pots, plates, bowls or vases out of clay? You need to book yourself onto a pottery class at Eskimo Blue. Ceramicist Charlotte Barker’s pottery business has been going from strength to strength lately, with Charlotte recently opening up a new shop in Silver Arcade in the city centre. But it’s her little studio on Lytton Road where it all started and it’s here that you can get up close and personal with a potter’s wheel and try your hand at an ancient technique which was first mastered in the near east as long ago as the 5th millennium BC. 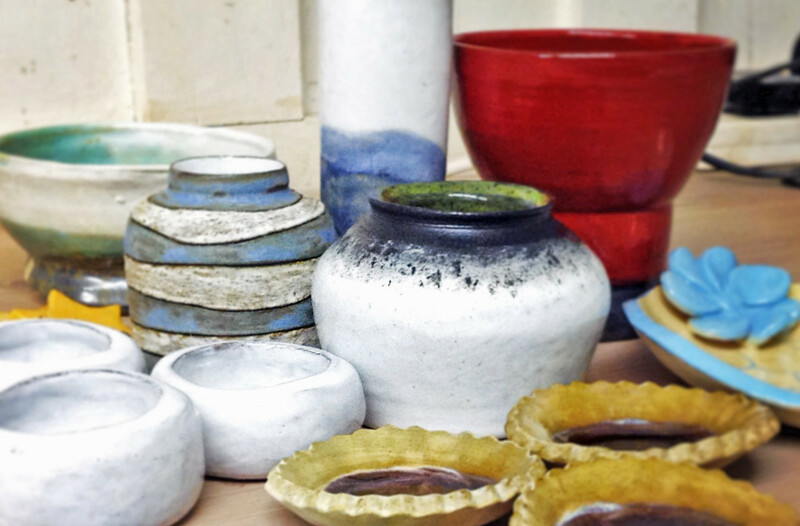 It’s not all about the wheel – as well as throwing pots you can learn how to build creations using coils and slabs of clay, as well as how to add colour using glazes. The class sizes are kept small so you get plenty of attention, and it’s amazing how much you can learn in a short time. I was thrilled to get one of the pottery ‘taster sessions’ as a birthday present last year and I can highly recommend this as a lovely and very original gift for crafty types who fit into the ‘has everything’ category! From pots to Scots now – or Scottish dancing to be exact. Leicester Caledonian Society was founded at a Burns Night dinner in 1878 and has been active ever since. It aims to encourage and celebrate Scottish literature, music and dance and to keep alive the traditions of Scottish ancestry. Open to Scots and non-Scots alike, the Society holds a variety of events and get-togethers throughout the year, of which the dances are some of the most popular. Scottish country dancing is a social form of dance which involves moving in a fairly strictly choreographed way and is accompanied by traditional, purpose-written Scottish tunes. Avenue Road School is the venue for the Society’s weekly Scottish dancing classes. The sessions take place at 7.30pm every Monday evening from September through to May and beginners are welcome. There’s no dress code and appropriate shoes are available to borrow for the session. Your first visit is completely free and at a regular price of just £3.50 per class for non-members you get plenty of ceilidh for your cash. Performer, writer, storyteller and teacher Mark Ferraby has been teaching people to play the ukulele and guitar for about 20 years. As founder of Queens Road Ukuleles he is responsible for introducing many Clarendon Park residents to what must be one of the most intrinsically fun musical instruments around. With the focus very much on enjoyment, if you fancy learning a musical instrument this year and want to do it in a light-hearted, lively environment with a group of like-minded folk, this little group is right up your street. Queens Road Ukuleles currently meet every Wednesday morning at the Friends Meeting House and every other Monday evening at the ‘Conservative Hall’ on the corner of Clarendon Park Road and Queens Road. This latter meet-up is a great option for those who fancy a bit of a strum after work, with tuition for beginners starting at 6.30pm and the whole session costing just £3.50 per person. Ukuleles are available at the session so there’s no need to buy your own straight away, and as the evening progresses the tuition meets the needs of more advanced players. You are also expected to stump up for a drink at the bar, which is only fair, and who knows, a pint or two might help loosen you up and benefit your technique. Another two handy hobbies for those with nimble fingers are knitting and its little sister crochet. Traditionally the preserve of homely granny-types, knitting has become hugely fashionable in recent years with a whole host of famous folk including Kate Middleton and Benedict Cumberbatch extolling the joys of knit and purl. As a knitter myself I can absolutely vouch for the gentle, cathartic effect of this engrossing pastime and the sense of accomplishment that comes from completing a project – even if I’ve never mastered anything much more challenging than a scarf! 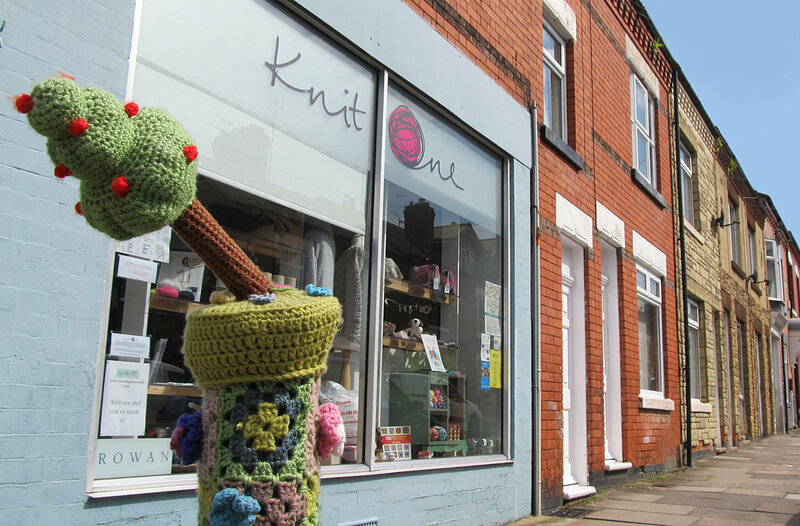 Queens Road’s own yarn shop Knit One is one of the most distinctive shops in Clarendon Park with its much-loved bollard cosies just outside. As well as selling yarn, patterns, books and other knitting paraphernalia, the shop also regularly hosts knitting and crochet classes for newbies. With only half-a-dozen people in each class you’re guaranteed plenty of teacher-time, which is a must when learning something so highly visual and fiddly. Courses of five or six separate lessons run throughout the year and generally take place on weekday evenings. Attendance on one of the courses entitles you to a 10% discount in the shop for the duration of the course – perfect for stocking up on supplies for your new hobby! Buddhism is a tradition of spiritual development and a way of life which an increasingly large number of people are interested in finding out more about. Much of this new curiosity is due to to an interest in the practice of mindfulness, and the widely acknowledged wellbeing benefits that regular meditation can bring. If you would like to learn more about Buddhism, there is a series of six-week Introduction to Buddhism and Meditation courses running throughout the year on Wednesday evenings at the Friends Meeting House on Queens Road. The courses are led by Alobhin, a member of the Triratna Buddhist Order, and are ideal for newcomers. The onus is very much on relaxed learning in a friendly, informal environment and while there is no official charge for the classes, you are asked to make a small voluntary donation. Time for something a bit more energetic now. Many people will know Carol Askew as the cheerful proprietor of Labels high-end designer dress agency on Clarendon Park Road. When Carol’s not selling Gucci handbags and Dior dresses, she is equally busy teaching people the fun and frantic art of La Pulsa at Leicester Squash Club, just off London Road. 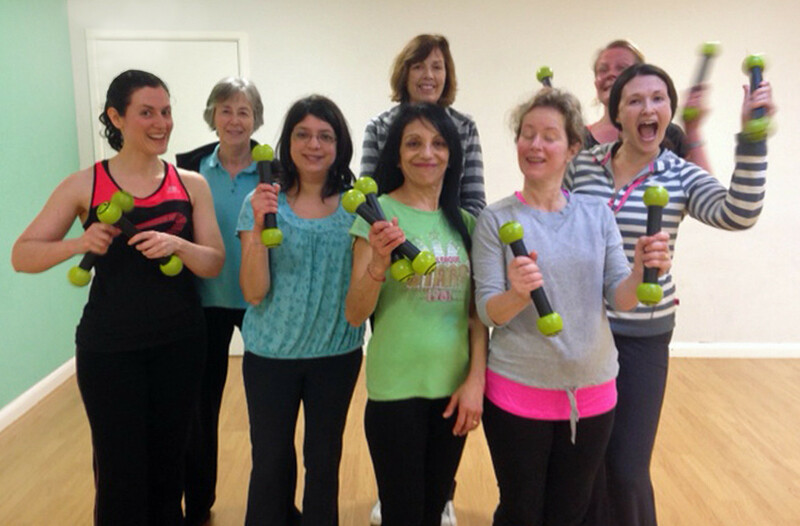 Making fitness fun with a La Pulsa exercise class. La Pulsa is Carol’s own unique take on Zumba, a fitness programme combining dance and aerobics, which originated in South America in the 1990s and has since become something of a global sensation. Fat-burning, stamina-building aerobic exercises are performed to music inspired by salsa, merengue, samba and hip-hop. With Carol’s classes on Monday and Friday mornings costing just £4.50, and no need to pre-book, it’s a cheap and cheerful way to kick-start your day. 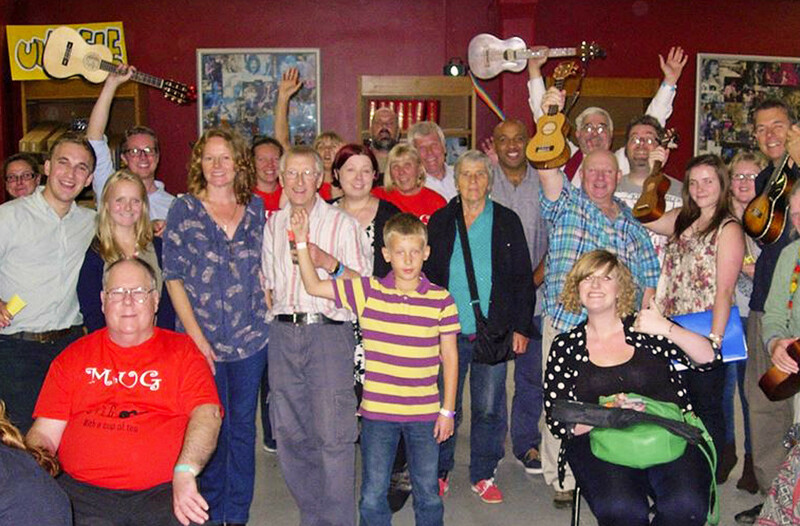 If vocal exercise is more your thing, Leicester Singsong has got just the opportunity for you. This friendly group aims to offer low cost group singing classes to adults who like to sing for pleasure. The emphasis is very much on having fun and meeting new people through a shared love of singing, and there are no entry criteria or auditions. Classes take place every Sunday from 5pm at Leicester Squash Club and your first session is just £3. Leicester Singsong is led by Verity who, as well as being a professional singer herself, is passionate about teaching professional level techniques to help others improve their singing. The group focuses on a chosen theme which changes seasonally, although you can join any time you like. There are also optional performances singers can get involved with in, and “friend and family” audiences which have been a real hit and give singers a specific goal to work towards. I hope you’ve enjoyed reading this eclectic little round-up of just a few of Clarendon Park’s many opportunities for grown-ups looking for fun ways to learn new skills. Do you attend or run a local course, craft lesson, workshop or exercise class? Comment below and spread the word! What a lovely article Ruth! We are so fortunate to have all these opportunities in our great little community, I’m going to have a go at being creative at Eskimo Blue. If you’re a woman interested in learning Morris dancing with a fun group of feisty females, Black Annis might be for you! We don’t practise in Clarendon Park but there’s a large CP contingent that goes every week so we’d be happy to pick you up/drop you home again after. We dance Cotswold Morris in the summer and Fens Molly in the winter, so there’s always something new going on. We’re about to start our summer season so it’s a perfect time to join us! You don’t have to have any experience, just a bit of enthusiasm and fun! We meet at the Church of the Martyrs hall on Westcotes Drive (off Narborough Rd) on Thursdays from 8pm – 10pm (sometimes we go for a drink at the Western afterwards too). You can find more info at the website (linked above) – please feel free to get in contact with us – you can email me at liedra at gmail.com. Thank you for getting in touch and sharing this info Catie – the Black Annis group sounds like a whole lot of fun! Just in case anyone can’t find the link to your website here’s a direct one: http://www.blackannis.org/ – love the costumes! Thanks Ruth! Yes, our kit is in suffragette colours as we have a strong feminist tradition. No skirts and frills for us!